Wardian Case: The Wardian case was invented by Nathaniel Bagshaw Ward, in 1829. By accident he found out that his ferns grew very well in bottles, and he developed this idea to a larger case to hold full-grown flowers. This meant a great increase in the amount of flowers available in Europe. It became easier to import flowers because they were encased in a constant climate and did not suffer from the change of air and temperature while they were transported, and it was easier to keep exotic flowers alive during winter. Lawnmower: The lawnmower was invented in the first half of the Nineteenth Century, and was inproved quickly from a large and difficult machine to something that could be used by hand, by everybody. (Of course, women would not mow lawns.) The invention of the lawnmower caused a big rise in lawns in garden design around 1840, where before mostly flower arrangements and grit were fashionable. 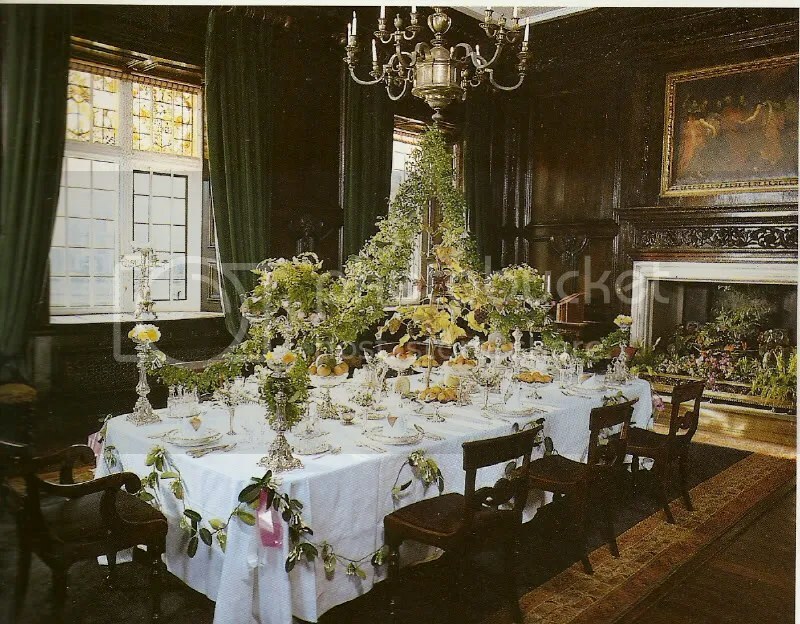 Using flowers in interior design: Of course the Victorians were keen to find new ways to decorate the interior. 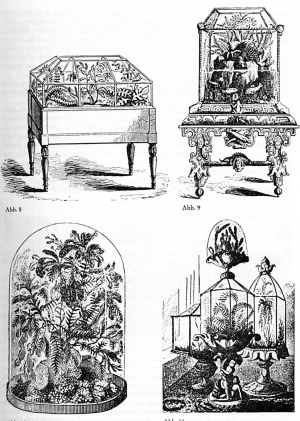 Flowers were increasingly used in the Nineteenth century, not just as a bouquet but arranged as large ornaments. Here are some images from the book “The Victorian Flower Garden” by Jennifer Davies. 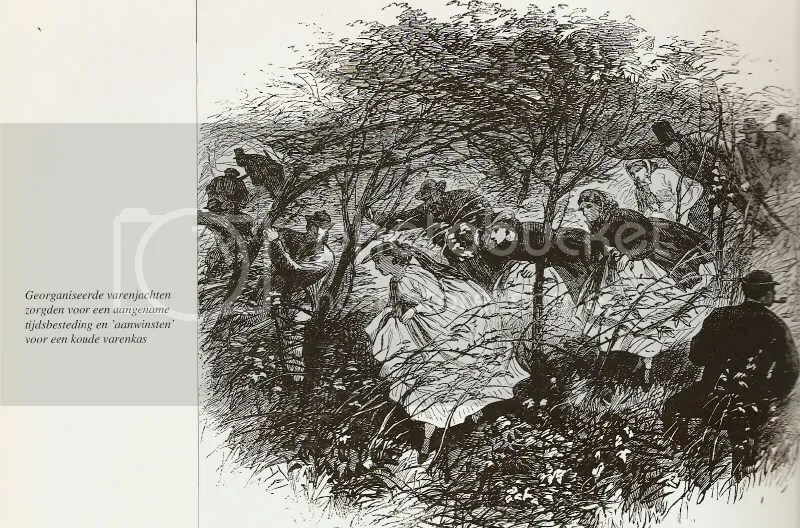 A popular pastime in the Nineteenth Century: an organized fern hunt. Found ferns could be added to ones fern collection, which was immensely popular. Thank you very much for this interesting information! Very interesting. 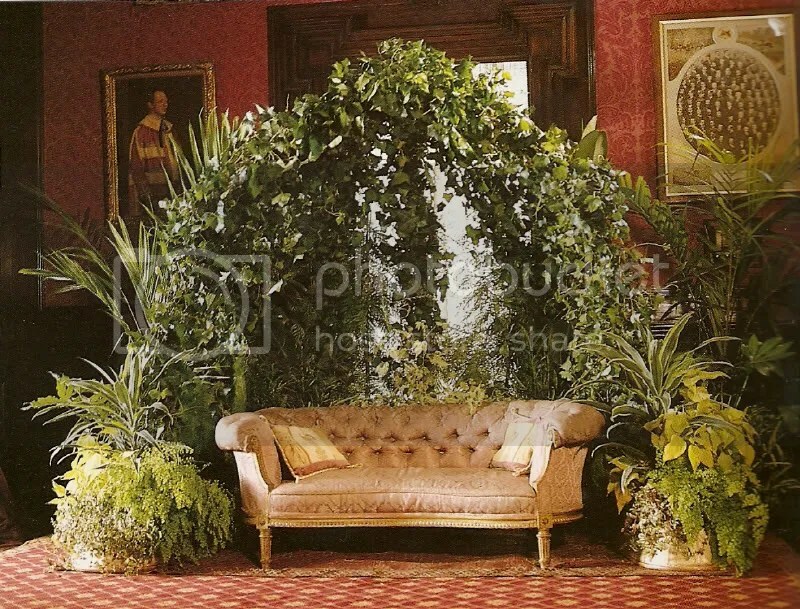 I love the way the flowers are used to enhance the furniture in those two photos from The Victorian Flower Garden, first the table and then the sofa. Also, I’m fascinated by the fact that the popularity of lawns followed the invention of lawnmowers. Convenience first! Those Victorians were resourceful. OMG, I must have a shady bower in my living room! Thank you for this article. I recognise those pictures! I was just looking at that book yesterday as a coincidence, it’s the Victorian Flower Garden isn’t it? Yes, it is! It’s a great book. I find it interesting that people back then were able to transport flowers in glass containers. This as I read was important for travel, as it kept flowers in the right condition. The glass designs seemed to intrigue me. The shapes were pretty amazing to gaze at. The fact that the people used them for decoration was astonishing. The picture with the flowers coming off the dinner table light all they way down to the table was amazing. Also coming around the chair. Im sure that it would take some form of artistic ability to complete this task. Gardening back then seemed to be more of a focus than it is today. Wow, what a nice blog, I’ve just begun to explore it and I can see I will be entertained for hours and hours! I enjoyed this insight into 19th century Victorian gardening in America. thanks so much. Love the visuals as well. Some interesting comments. I’m writing an article on Impressionism and gardens, especially British ones.